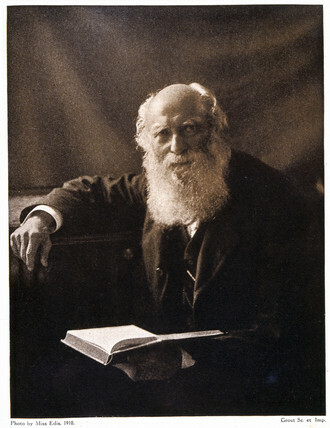 George Johnstone Stoney, Irish mathematical physicist, c 1900. Stoney (1826-1911) was an Irish mathematical physicist responsible for introducing the term 'electron'. Stoney's researches were on physical optics and spectroscopy (following on from the work of George Gabriel Stokes) and molecular physics. He also produced papers on the planetary atmospheres. At the 1874 British Asociation Meeting in Belfast, he spoke of 'an absolute unit of electricity (which) exists in that amount of it which attends each chemical bond or valency'. He later proposed the term 'electron' in place of the term 'corpuscle' proposed by Joseph John Thomson (1856-1940).